Although looking for a way to train dogs in not easy, a click sound and following it up with a tasty grub can easily trick your dog to behave just the way you want it to behave. The trainer generally uses a plastic device with a spring inside that makes a “click” sound to attract the dog. 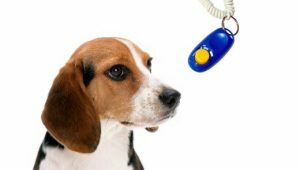 Known as clicker, the device is effortlessly pressed by the trainer whenever he or she wants to get the attention of the dog. How Clicker does its Job? A dog relieves itself at a spot in the backyard just as the trainer wanted it to. The trainer presses the clicker, and a quick “click” sound is generated. The dog’s attention is drawn to the sound. The trainer picks up a titbit and offers it to the dog. Similar action is repeated each time the dog relieves at the same spot for the next few days. The dog gets into the habit of relieving itself at the same location. …And, the clicker is used to teach the dog that relieving at the right spot would enable it to get a reward. It has a distinct, sharp sound. It follows an attractive, tasty reward. It instantly delivers its result i.e. attracts the attention of the dog in a fraction of second. So, the dog can identify the exact action for it being rewarded. It does not require much effort to click unlike voice commands. Use clicker and reward therapy to encourage a series of good behaviors as expected from a social, amiable, and discipline dog, such as sitting at the right place, house-breaking, toilet training, and so on. Just watch your pet, click and reward regularly and frequently to provide free-shaping therapy. In the initial days, clicker must be followed with a treat if you want it to work as a training tool. To train a puppy or an untamed dog, clicker must be used for all good behaviors you see. Delay the click if you wish your pet to follow a command and stick to it for some time, say for instance, make it sit for longer time at a particular place. …Watch how the good behaviors increase i.e. number of clicks increase while bad behaviors erode away. Timid dogs who are motivated for the reward. Aggressive dogs that learn to check their bullying behavior for the reward. Rescue dogs which have to be weaned off from bad training. Dogs of all nature and species quickly and effectively as it does not coax or coerce the pet. Pets without losing energy or getting frustrated through repeated voice commands. Hyper active dogs properly, as it times the action and reward accurately. …And, at a later stage, treats can be hidden as the dog learns that click means a tasty grub. The training time with a clicker is fun and an entertaining game for both you and the pet. Check out my review about the best dog training expert Doggy Dan here.